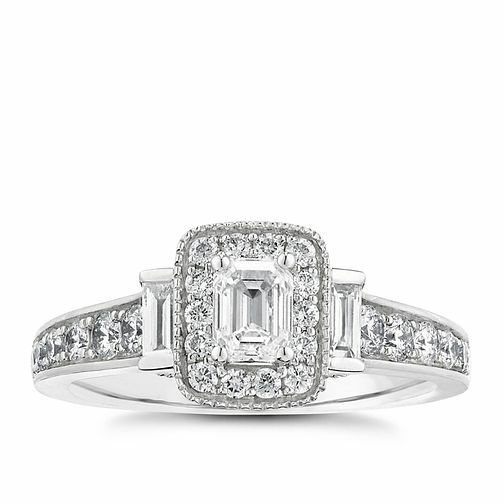 Designed with a graceful and classical poise, this beautiful engagement ring from the Vera Wang LOVE collection features a halo design with a beautiful emerald cut centre diamond. The sides of the halo are embellished by two baguette cut diamonds for a wonderfully modern design sentiment. When viewed from the top the ring dazzles with the centre diamond wrapped around a halo of smaller diamonds, connected with a further line of diamonds on the left and right sides for a luxurious look when worn. As an authentic Vera Wang piece, the inside of the engagement ring shank includes the Vera Wang LOVE inscription and her signature blue sapphire that sits underneath the setting. The carat weight of all diamonds combined 0.95ct. Vera Wang 18ct white gold 0.95CT diamond engagement ring is rated 5.0 out of 5 by 3. Rated 5 out of 5 by Anonymous from I am in love with this ring! I can't believe the beauty of my new engagement ring. It's classic but feels modern at the same time. It's a real showstopper and so sparkly too.